“Khan Market,” I replied to my friend on WhatsApp. Indeed. 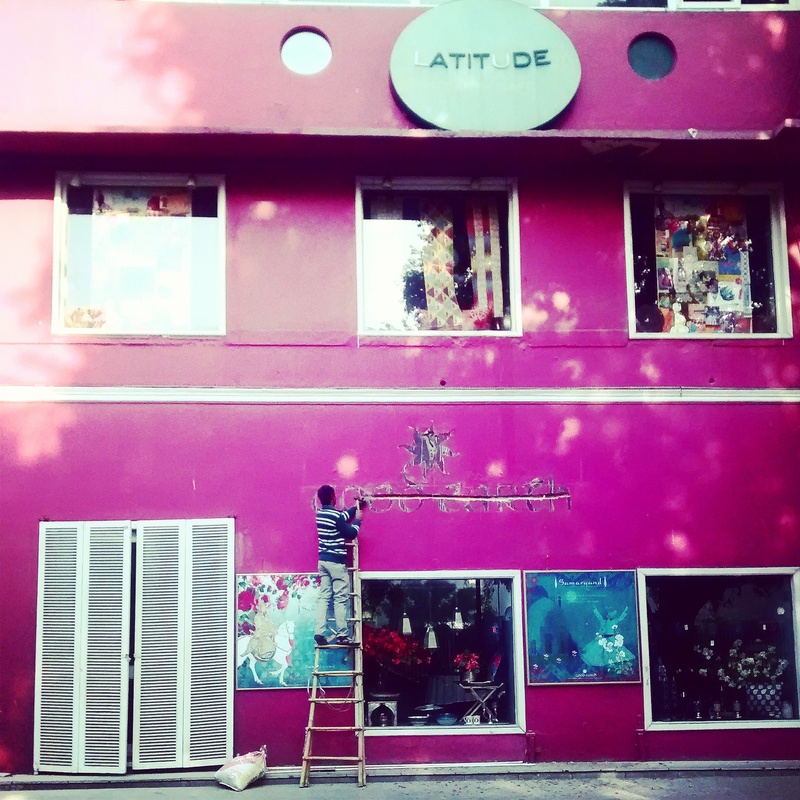 Delhi’s Khan Market is a posh party hole that wakes up only after sunset. Established after partition for Pakistani migrants, Khan Market is now the most expensive retail location in India and one’s of the world’s costliest. The shopping complex is in the vicinity of – Ambassador Hotel, a heritage building built in 1945 by architect Walter George; Sujan Singh Park, Delhi’s first apartment complex and the residence of the late Khushwant Singh; a mosque that is surrounded by a famous nursery; a synagogue; and cemeteries for Christians, Parsis and Jews. On a Saturday morning, after finishing my graveyard shift, I decided to have breakfast at Market Café. While the café was yet to open, I decided to explore Khan as if it were my maiden visit. And, maiden it was. I found the closed shutters of stores and their billboards perfect subjects. The broom was everywhere. At the end of the middle lane, I saw sunlight in abundance. The middle lane is usually the sight of partygoers impatiently waiting to get their names struck off the waiting list. At the top of one store, Dayal Opticals, I saw Khan Market written in Hindi on a yellow wall that has a quaint white window. On the first floor of the building that houses Market Cafe, a pastel green ante room caught my attention. Around my breakfast table, I saw pictures of Qutub Minar on the walls. A plate of cheese omlette, hash brown and toasted bread looked photogenic as well. I downed two glasses of fresh apple-pomegranate-beet root juice. Christmas trees, flowers, vegetables dotted Khan Market. In a corner, a dog in a red jacket soaked up the sun. On the other side, I found rusted leaves fascinating to shoot. The Good Earth store, that never grabs my attention because it is for the deep-pocketed, basked in its majenta façade as a workman repaired it. 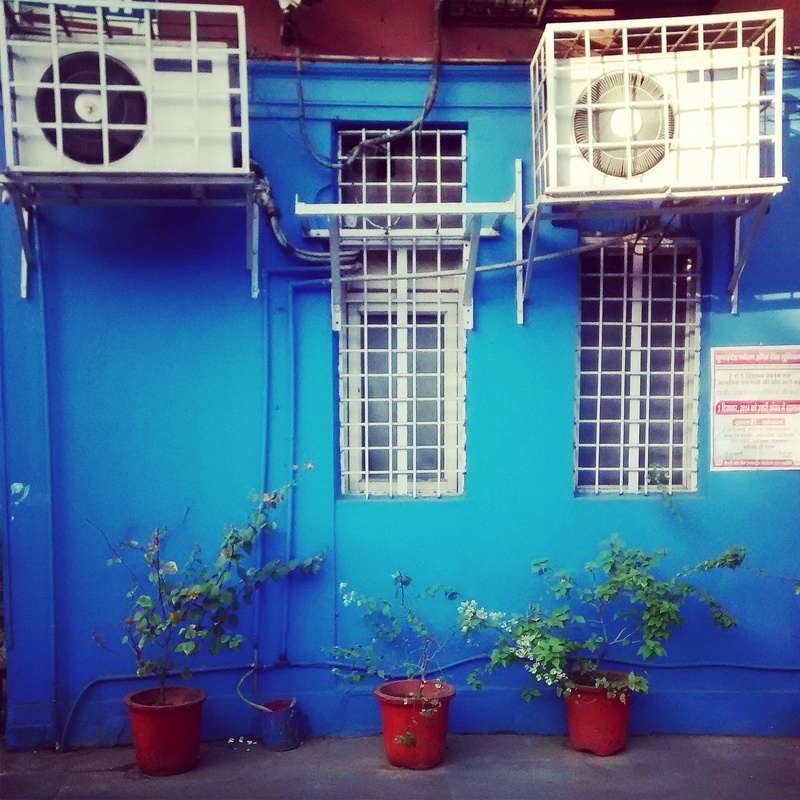 Bank of India’s Khan Market branch was picturesque too – three flower pots were meticulously placed against a blue wall that had white windows. On the wall, a bill had been stuck. And yes, you can find newspapers at Khan, too. A man prepared his home decor shop for the day. A bag of garbage and beer bottles made my photo trip complete. It was Saturday morning after all, when you wake up in search of Anacin, lime juice or tea, probably. On the way to the metro station, a pale brown wall showed ‘PCO’ written on it in graffitti style.